>2% of the four million babies per year born in the United States (U.S.) are known to be exposed to opioids, but the actual number is likely higher. Exposure to opioids in utero causes addiction, which, upon birth results in Neonatal Abstinence Syndrome — severe withdrawal. Over 80,000 newborns/year are affected, increasing newborn hospital stays eight-fold and costs twenty-fold; causing unnecessary pain and suffering. The grant will be used to develop a new platform to detect opioids and their primary metabolites in newborns, enabling rapid treatment. According to the National Institute on Drug Abuse , overdoses from synthetic opioids, including fentanyl, spiked to almost 30,000 in 2017, up from 5,000 just three years prior. As the availability and use of powerful synthetic opioids escalates, first responders, law enforcement, medical personnel, remediation workers and forensic laboratory personnel are increasingly at risk. Base Pair Biotechnologies has been awarded a grant from the CDC to develop aptamers and lateral flow assays (simple strip tests) for the rapid detection of several synthetic opioids on surfaces. Detection of the presence of powerful opioids can reduce accidental exposure, improve remediation efforts, and confirm required treatment in response to accidental exposure. The grant award titled “Identification and/or Creation of Aptamers with Affinity to Fentanyl, Carfentanil, Acetyl Fentanyl, and Naloxone: Development of Prototype Lateral Flow Assays” is focused on field-based detection of several potent synthetic opioids. Interested in opioid aptamers or detection? Interested in opioid aptamers, custom aptamer discovery for other small molecule drugs, or investing in opioid projects at Base Pair? Contact Us for for information. The statistics are staggering and addiction is on the rise. • Between 26 million and 36 million people worldwide abuse opioids (12) • The NIH estimates the annual number of overdose deaths in the U.S. has risen from over 20,000 in 2002 to over 50,000 in 2015 (12) • According to the U.S. Drug Enforcement Administration, hydrocodone and oxycodone have been the two most widely distributed controlled prescription drugs in the U.S. from 2006 to 2014. Since 2002, the number of deaths linked to prescription pain killers has exceeded the numbers due to cocaine and heroin combined. (4) • A CNN news report and research letter published in JAMA Pediatrics on December 12, 2016 reported that the incidence of neonatal abstinence syndrome (NAS), or opioid withdrawal in newborns, increased 5-fold in the U.S. from 2000 to 2012. (3,16) Misuse of prescription pain killers is leading to the use of more potent pain killers, dangerous drug combinations and the use of illicit drugs – drugs that are completely unregulated and more powerful than ever. Tests for detecting a wider range of opioids and common contaminants could assist law enforcement in the identification of “tainted” drugs, assist health care providers in identifying drug compounds or cocktails that were ingested or are present in newborns, and assist family members in diagnosing drug dependence. Detection of opiates in newborns can enable treatment prior to symptoms of withdrawal. While there are several FDA-approved home use tests for drugs of abuse, including cocaine, methadone, morphine, and oxycodone, tests for many synthetic and semi-synthetic opioids are lacking. (6) In January 2014, law enforcement in some towns began administering naloxone, to reverse opioid effects in cases of overdose. (10) In March 2014, the FDA approved a hand-held device for administration of naloxone by family members. (17) Identifying opioid use can enable access to early treatment. Developing specific reagents and tests for detecting opioids and opioid metabolites has proven difficult and time-consuming. While research abounds with antibodies to opioid receptors, antibodies to opioids themselves are few and far between. Because opioids are small molecules, their immunogenicity is generally low and techniques for altering small molecules to induce antibody production often fail or negatively affect antibody specificity. (9,7) In recent years, researchers have been turning to aptamers. In 2006, researchers at the University of Illinois developed a simple test for cocaine in bodily fluids using aptamers. (8) Since then, similar tests for common drug compounds, such as methamphetamines, have been published. (5,15) In response to the growing use and abuse of a wider range of opioids, Base Pair has successfully developed several aptamers that are selective for opioids and opioid metabolites. 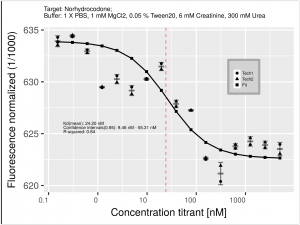 Base Pair performed an aptamer selection project for the National Institutes of Health using a urine-like synthetic buffer formulation to generate opioid aptamers with high selectivity and affinity to several opioids and opioid metabolites for detection in neonatal urine. 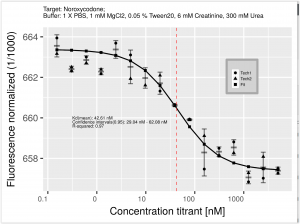 Binding curves for noroxycodone and norhydrocodone, specific oxycodone and hydrocodone metabolites (2), obtained using microscale thermophoresis (MST) are shown below. The aptamer to noroxycodone bound with an affinity (dissociation constant) of 43nM. A second aptamer bound to norhydrocodone with an affinity (dissociation constant) of 24nM. Aptamers to oxycodone, hydrocodone, fentanyl and their metabolites (noroxycodone, norhydrocodone, norfentanyl) have been selected. Contact Base Pair for more information on the opioid aptamers mentioned above and aptamers to other drugs of abuse and drug metabolites. DEA. National Drug Threat Assessment Summary. DEA-DCT-DIR-001-17. Nov 2016. Ebrahimi, M. et al. Electrochemical impedance spectroscopic sensing of methamphetamine by a specific aptamer. Bioimpacts. 2012;2(2):91-954. FDA. “Drug of Abuse Tests.” 24 Feb 2016, http://www.fda.gov/MedicalDevices/ProductsandMedicalProcedures/InVitroDiagnostics/DrugsofAbuseTests/default.htm. Accessed 13 Dec 2016. Gani M, Coley J, Piron J, Humphreys AS, Arevalo J, Wilson IA, et al. Monoclonal antibodies against progesterone: effect of steroid-carrier coupling position on antibody specificity. The Journal of steroid biochemistry and molecular biology. 1994;48:277–82. John Wiley & Sons, Inc.. “Test Strips For The Rapid Detection Of Cocaine.” ScienceDaily. ScienceDaily, 22 November 2006. <www.sciencedaily.com/releases/2006/11/061121232710.htm>. Kuby, Janis. Immunology. New York: W.H. Freeman; 1997. Leinwand-Leger, Donna. “Police carry special drug to reverse heroin overdoses.” USA Today. 3 Feb 2014, http://www.usatoday.com/story/news/nation/2014/01/30/police-use-narcan-to-reverse-heroin-overdoses/5063587/​. Accessed 13 Dec 2016. Moghaddam A, Lobersli I, Gebhardt K, Braunagel M, Marvik OJ. Selection and characterisation of recombinant single-chain antibodies to the hapten Aflatoxin-B1 from naive recombinant antibody libraries. Journal of immunological methods. 2001;254:169–81. National Institute on Drug Abuse. America’s addition to opioids: Heroin and prescription drug abuse. https://www.drugabuse.gov/about-nida/legislative-activities/testimony-to-congress/2016/americas-addiction-to-opioids-heroin-prescription-drug-abuse. Accessed June 6, 2017. National Safety Council. Opioid painkillers: How they work and why they can be risky. http://www.nsc.org/RxDrugOverdoseDocuments/opioid-painkillers-how-they-work-and-why-they-are-risky.pdf. Accessed June 6, 2017. Opiate.com. Opiates. http://www.opiate.com/opiates Accessed 13 Dec 2016. Shi, Q., et al. Colorimetric and bare eye determination of urinary methylamphetamine based on the use of aptamers and the salt-induced aggregation of unmodified gold nanoparticles. Microchimica Acta. 2015;182(3):505-11.17. Villapiano, N.L.G. et al. Rural and urban differences in neonatal abstinence syndrome and maternal opioid use. Journal of the Americal Academy of Medicine: Pediatrics. Doi:10.1001/jamapediatrics.2016.3750. 12 Dec 2016.